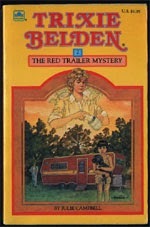 Trixie Belden and the red trailer mystery (first published 1950) by Julie Campbell - reviewed by Alex G.
Trixie's and Honey’s friend Jim has run away. He didn’t like his stepfather, and has also just become the heir to a fortune.They go driving around in a caravan (trailer) to find him. They come across a red trailer, where the family is acting weird (sad). The daughter Joanne later goes missing too. They go to a boys camp to find Jim but he appears to be one step ahead all the time... he is not there. 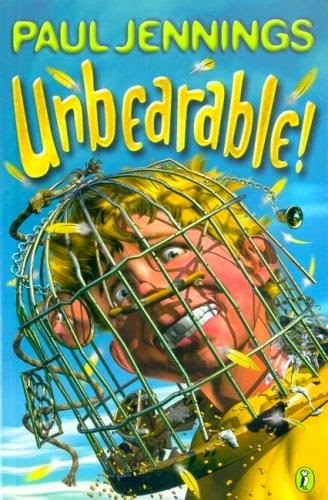 They meet a lady who owns a farmhouse and other characters along the way to find Jim and Joanne. Do they find out where Joanne and Jim are? "There are other books in the Trixie Belden series. I love how the story is mysterious... you know something is going to happen. It is purposeful." Andrew's dad is mad about flies. He swats them all the time. He is also mad about table manners. Mr Spinks comes over for tea one night. Mum agrees with dad not to say anything about table manners. They have soup and Andrew’s slurping gets louder and louder... their next meal is chicken... he says "I’ve got a chicken’s bottom! and then there is baked apple with custard." Its funny when he starts licking the fly swat, but he is only pretending there are flies on it as he bought a new fly swat and some currants and licorice. "This is a funny story from the 'Unbearable' short story collection. It is not as good as the last one I read called “Lucky lips” from the 'Unreal' collection of short stories." 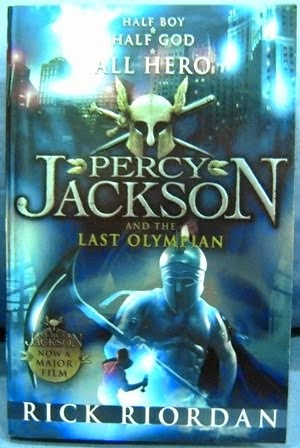 In this book, Percy the demigod, now 16 years old, leads his friends to defend Mount Olympus which is under attack by the EVIL Kronos (who is really evil, even beyond evil!). The story is about how Percy defends - I won’t say anymore except he even gives away the idea of immortality! "Percy Jackson is my favourite book. It keeps you on the edge of your seat. I like the way it is written in the first person - Percy telling the story - it is more involving!" This is the final book in the series as Percy has aged from 12 through to 16. Billie is playing hairdresser. She wanted to cut Jack’s hair (her best friend), but he said no. They have a bit of quarrel. She cuts her doll’s hair instead. Her idea is then to cut her own pigtails. She starts crying, but then is happy as she realizes her own hair will grow back. "I liked the middle (chapters 2 and 3) the best." The ring of earth : bk. 4, Young Samurai by Chris Bradford - reviewed by Alex W.
Jack Fletcher is training to be a ninja, and now he is on the run. Shogun samurai are chasing him and then he is kidnapped by the Ninja and taken to a village. Who will kill him first? "It’s more on the edge of the seat than Percy Jackson!" Bruno, an eight year old boy, is moving house. He sees a big house in the distance with mini sheds and a man shouting at people with striped pyjamas. He hears his dad talking to soldiers and them saying 'heil Hitler'. "I’m only half way through story. It is very interesting,especially to read about what it was like during World War 2 and the concentration camps."